Helping you make a short-list of bookkeeping business names from which you can select the most suitable one. Choosing a name is like choosing a name for an unborn child. It needs to be done with thought and care because once it’s chosen and the name registered with the companies’ office you will be stuck with it. Sure, you can change it but that’s a costly exercise (having to get all the stationery re-printed)… and it’s a time waster when you are busy trying to grow the business. How Do You Want Other Businesses To See You? This is more than just a name or title that represents your business. It is about branding. It is the whole package that comes with you and your business. Does the name suit what you are offering? What is branding? Look at Google, Coca Cola, You Tube and all the other famous ones in the image above. 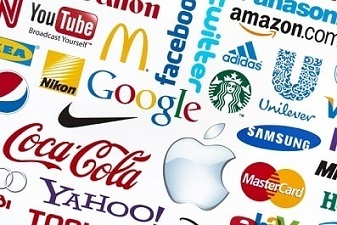 Their brand is known world-wide – they have a certain look, colour scheme, logo that are easily recognizable, and simple. Are you going for a more relaxed home office type look, a highly sophisticated look, or somewhere in between? If you are offering a straightforward bookkeeping service then your business name could include the word ‘bookkeeping’, or if you are offering more than that then you can chose a more holistic term like ‘business’ or ‘office’ or ‘consulting’ or ‘services’ and so on. Using alliterations can be catchy and help people to remember the name of your business. That means that you could use words beginning with the same letter such as what we’ve done with Beginner Bookkeeping. Bookkeeping does not have to be boring, but you also need to be taken seriously when dealing with other businesses’ finances! So finding a balanced look is important as well as aiming at being unique from other brands. There are two ways of developing your brand, one with an all about you and what you offer approach, or one with an all about the client and what it is they’re looking for. You may want to focus on certain types of businesses where your expertise is most useful and as such be able to charge a higher rate. For example, if you are solely targeting the trades sector, you probably wouldn’t incorporate flowers in your branding! Instead you might use a strong name and a strong design with images of tools or something along those lines that would grab the attention of trades’ business owners. Should You Use Your Personal Name? There’s nothing wrong with incorporating your own name as part of your bookkeeping business name and many professionals do it particularly with their family name - take a look through your Yellow Pages to see examples. Using your own name will require a lot of marketing on your part because other businesses will not know just by your business name (your name) what it is you do. If you intend on having a strong online presence you could consider using a name based on the kinds of words people search for in their web browsers. When they search for a bookkeeper such as yourself, they won’t know what your name is but they will know what they are looking for and might type in something like ‘bookkeeping service in [name of town]’. So if you live in Timbuktu your online type business name could be Timbuktu Bookkeeping Services, rather than Jane Smith Bookkeeping (which is the all about you approach). What does this mean? Many business owners might be sole traders and will go by their personal name on all the official documents but be trading as the name of their choice. For example, John Smith trading as Bookkeeping World. Or someone might buy a business that’s already set up and rather than go through all the hoops of officially changing the name to one they prefer, simply use the trade as option to use the name they prefer. For example, Smith’s Books trading as City Bookkeeping Services. This means the name at the Companies’ office will be registered as Smith’s Books, but be promoted to customers as City Bookkeeping Services. You will need to check that the names you like the most haven’t already been taken by another business. In your web browser search for ‘company name availability in [name of country you are in]’. This should bring up the Companies office in your country where all businesses register their company names and where you can do a search. If you are working as a sole trader and don’t want to register a company name, you should still make sure that someone hasn’t already registered the name you want to use. A registered business could take you to court if your business name is the same or too similar to theirs. Remember to check that the names haven’t been used already by other businesses. List of Basic Business Names to Get You Started! You can add in the ‘Ltd’ or ‘Inc’ or whatever it is your country uses at the end, unless you are a sole trader. Get 2 It …. and brainstorm your own business names now! *None of these have been checked at any companies’ office or on the internet. You need to make sure they have not already been registered by another business in your country.